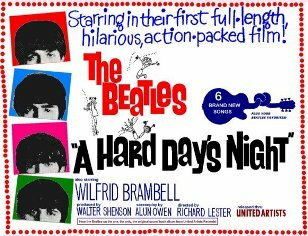 Poster for A Hard Day’s Night starring The Beatles, another United Artists profit engine. Although it’s hard to imagine now, there was a time when some people didn’t like the music from The Beatles. Back in 1964, the group was still a relatively new band that the teenagers went crazy over. In contrast, adults thought of The Beatles as a fad, as ephemeral as a lightening. Oh, and they also thought The Beatles made nothing but noise. Shocking, isn’t it? Positively shocking. The truth is that every adult thinks of the next generation’s music as garbage. There’s even a term for it: Generational Gap. During the ’60s the producers, directors and even actors in the Bond films were way above their 30s and The Beatles was the music of teenagers. Of course, they’d hate it. It should be noted that both Bond (via the series produced by Eon Productions) and movies featuring The Beatles were major contributors to the profits of United Artists in the 1960s. Now, fast forward to the next decade when the same producers wanted to introduce another actor in the role made famous by Sean Connery. They were careful and hesitant. After all, they had attempted the same feat four years earlier with the then-unknown George Lazenby, a man who had a passing resemblance to Connery in that they were both broad-shouldered, black haired and squared-faced. This time they were using a dark blond thinner man that had had his bit of fame in the small screen with The Saint. Still, the producers insisted on Roger Moore went a different way from Connery in every possible way. That premeditated distance meant Bollinger replaced Dom Perignon. Gone were the cigarettes and in their place Moore smoked cigars when he was not making snake barbecue. Not to mention the absence of vodka dry Martinis, Moore ordered Bourbon. By my count, Bond lost two Walter PPKs in the course of this adventure, and thus for the final battle he sported a heavy silver-plated revolver—perhaps influenced by 1971’s Dirty Harry. There was one other major difference: The artist playing the title song was none other than a former Beatle, and the producers loved him enough they removed the earmuffs! Paul McCartney’s song (written with Linda McCartney) went on to become a Bond classic in its own right. Of course, ten years had passed and The Beatles had proven themselves as artists with staying power, even after they broke up. Furthermore, the youngsters from the early ’60s had grown up and they were the target audience for the ’70s. What a difference a decade can make. What’s more, former Beatles producer George Martin (1926-2016) helped sell producer Harry Saltzman on the song. Martin also scored the movie. Despite its flaws, Live and Let Die has endured and has become Moore’s best performance of the character—perhaps followed closely by For Your Eyes Only. The self-imposed distance must have helped. Then again, the old adage that the more things change the more they stay the same is also true in this instance. Moore wasn’t imitating Connery, but as part of an ongoing series the movie kept enough mementos of the previous decade: Bond wore a Rolex as in Goldfinger; there were sharks like in Thunderball; and of course, double-entendre quips still ruled. “Sheer magnetism,” says Bond as he lowers the zipper of an Italian agent’s dress with a magnet. J.H. Bográn, born and raised in Honduras, is the son of a journalist. His genre of choice is thrillers, but he likes to throw in a twist of romance into the mix. 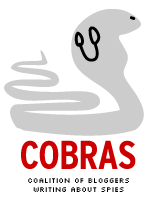 His works include novels and short stories in both English and Spanish. For more details, check out his website, http://www.jhbogran.com. Hail to the King! 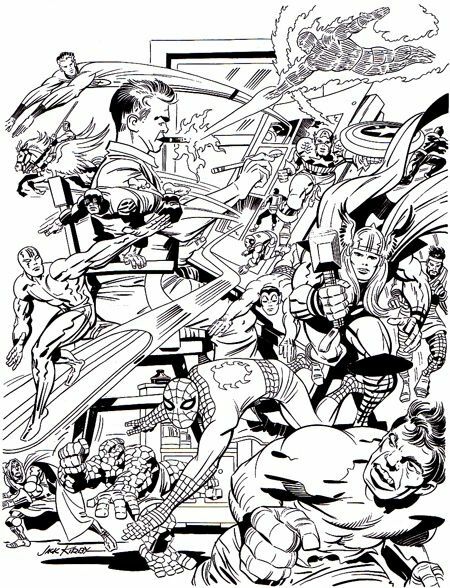 Aug. 28, 2017 is the 100th anniversary of the birth of comic book artist Jack Kirby. “Comic book artist” actually is an inadequate description. Comic book creator is more like it. His nickname was the “King.” It was deserved. Kirby lived the stories he drew in his mind. The characters he depicted existed in that fertile imagination. At one point his beloved wife Roz banned Kirby from driving. He was so distracted devising new stories he wasn’t safe behind the wheel. In the 21st century, much of the output of Marvel Studios wouldn’t be possible without Kirby’s contributions: Captain America (co-created with Joe Simon in 1941), the Avengers (co-created with Stan Lee in 1963), Iron Man (co-created with Lee, Larry Lieber and Don Heck, also ’63), Thor (co-created with Lee and Lieber, ’62), Ant-Man (Lee and Lieber, ’61), the Black Panther (co-created with Lee, 1966). Not to mention the X-Men (co-created with Lee, ’63) that are licensed by 20th Century Fox. Walt Disney Co. reached an out-of-court settlement with the Kirby family that ensured the company would maintain control. Terms weren’t disclosed but ever since Kirby’s on-screen credit in Marvel-made movies is more prominent. Still, Kirby (born Jacob Kurtzberg) isn’t as well known among the public as Stan Lee is. Stan was the showman and promoter. Kirby was the workhorse at the drawing board who dreamed up much of the story content. Stan gets cameos in every Marvel movie. Kirby got a cameo in one episode of the 1970s Incredible Hulk TV show. This isn’t intended as a criticism of Stan. 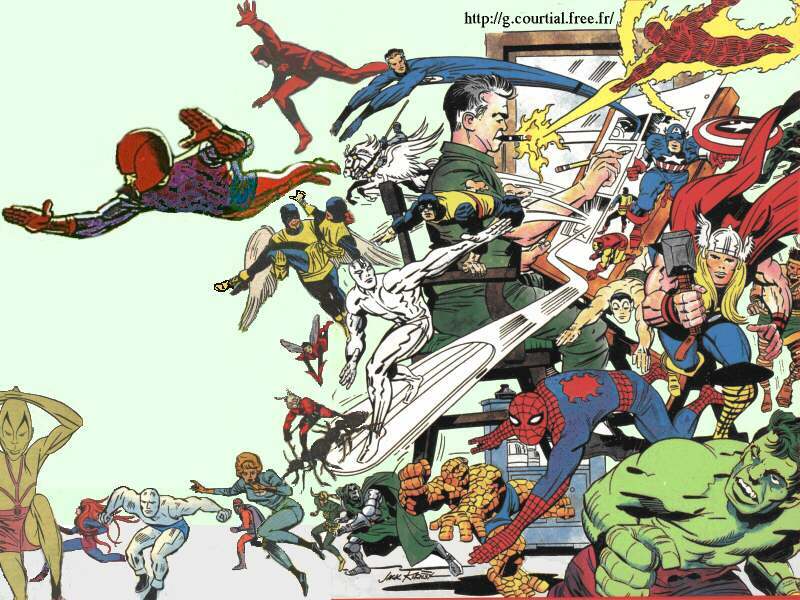 For several years in the 1960s, there was a magic every time there was a Stan Lee-Jack Kirby story published by Marvel. It’s just that Kirby deserves more notoriety than he has received. Kirby has some detractors who note his drawing style wasn’t realistic. In a 2005 documentary, artist Neal Adams said that missed the point. “I don’t think Jack could really draw anatomy,” Adams said. “I don’t think Jack could draw a real car. That wasn’t Jack. He was a visceral animal. (He) drew impressions of things. No one else could. That’s why Kirby was the King. 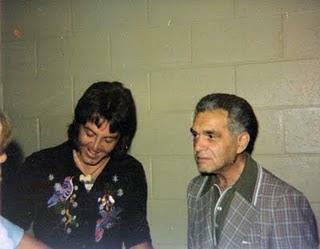 To read about the 1976 meeting between Jack Kirby and Paul McCartney, CLICK HERE to read a post from the Jack Kirby Museum website. To view frequently asked questions about Kirby, prepared by his biographer Mark Evanier, CLICK HERE. UPDATE (2:45 p.m., Eastern time): Evanier, who once worked as an assistant to Kirby, has his own tribute you can view by CLICKING HERE. Kevin Feige, president of Marvel Studios, sent out a post on Twitter on Monday afternoon. George Martin was the first composer to face the challenge that would later come to Marvin Hamlisch, Bill Conti, Michael Kamen, Eric Serra, David Arnold and Thomas Newman: to replace the role of John Barry in a James Bond movie. But in 1973, John Barry was busy composing a musical and unable to score Roger Moore’s debut in the franchise, Live and Let Die. He suggested George Martin, who had been producer of The Beatles. It was a huge challenge: a new Bond had to be introduced and a new era in the series had begun. And every time a new actor is seen in the 007 gunbarrel logo, the composer has to adapt his tunes to the interpretative style of the new Bond and other topics of the movie: the script, the settings and the period of time. George Martin was the first to take up the challenge of following in Barry’s footsteps and passed with flying colors. The score for Live and Let Die is explosive, adrenaline filled and exotic. Tracks like “Trespassers will be Eaten,”, “Bond to New York” and “Whisper who Dares” capture the adventurist feeling of Roger Moore’s Bond adding an atmosphere of thrills and excitement. “Bond meets Solitaire” and “The Lovers” accentuate the delicateness of Jane Seymour’s Solitaire. The Caribbean flavor of the film is transpired in tracks like “San Monique,” “Sacrifice” and “Baron Samedi’s Dance of Death” while the main motif of the title song is repeated often through the album, either to cue action sequences like the boat chase or as a source music, in a soul version performed by B J Arnau as James and Felix visit the Fillet of Soul bar. 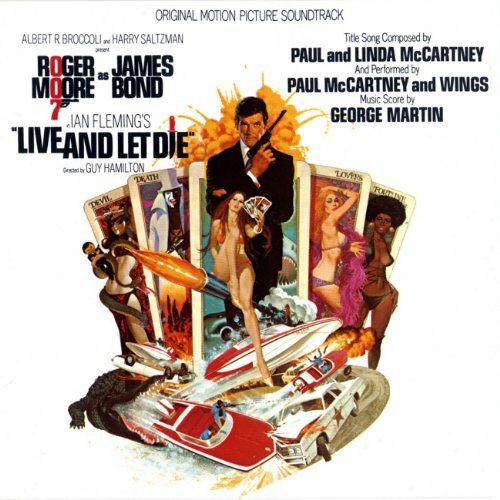 The main title song, Live and Let Die, was also produced by George Martin who insisted to producer Harry Saltzman to hire Paul McCartney for the title song, warning him he’d drop the project if he refused. Saltzman, a man hard to convince, went for the deal and Martin wasn’t wrong: the song, written by Paul and his wife Linda the same day they finished Ian Fleming’s novel, was the first Bond theme to get an Oscar nomination and it’s widely admired by Bond fans, brilliantly striking with Maurice Binder’s terrifying and colorful main title sequence. Just like You Only Live Twice’s Asian feeling, Goldfinger’s swinging melody and Diamonds Are Forever’s luscious sound, Live and Let Die lets the influence of the new decade (the 1970s) fill into the soundtrack in a clever and representative way. George Martin proved indeed the golden sound of Bond, established by John Barry, could be provided by many talented composers. George Martin, producer for The Beatles and a key musical contributor for Live And Let Die, has died at 90, ACCORDING TO AN OBITUARY IN THE WALL STREET JOURNAL. Obituaries understandably concentrated on his work with The Beatles. But he was also a major contributor for the eighth James Bond film, helping to sell the Paul and Linda McCartney title song to producer Harry Saltzman as well as scoring the film. Paul McCartney sought Martin’s help in preparing a demo version of Live And Let Die. McCartney wanted a big sound, something that would rival John Barry’s work on the 007 series. Martin presented the demo to Saltzman, who liked the song but wanted a female singer to perform it. In a 2006 television special, Martin recalled he had to finally tell the producer that it was a package deal — he either took the song and McCartney or got nothing. Saltzman chose wisely and took the package. The title song would be nominated for an Oscar, losing out to The Way We Were. 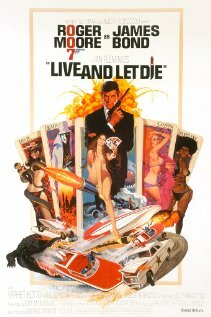 Live And Let Die marked a new era, with a new 007 (Roger Moore). Its title song was the series first truly Bond rock song. In a 2006 U.K. survey about Bond songs, Live And Let Die ranked third overall and No. 1 among those 45 and younger. Martin also took on the task of taking over the scoring chores from Barry, who had established the 007 film sound. He deftly wove the title song into the score while preserving elements of Barry’s musical template. How very sad to wake to the news Sir George Martin has left us. He made my first Bond film sound brilliant! The result? Live And Let Die, which debuted 40 years ago this month, would prove to be, financially, the highest-grossing movie in the series to date. Saltzman liked the song, but inquired whether a woman singer would be more appropriate. Martin, in an interview for a 2006 special on U.K. television, said he informed Saltzman if Eon didn’t accept McCartney as performer, the producer wouldn’t get the song. Saltzman accepted both. But Live And Let Die is one of the most important films in the series. As late as 1972, the question was whether James Bond could possibly continue without Sean Connery. With $161.8 million in worldwide ticket sales, it was the first Bond film to exceed the gross for 1965’s Thunderball. In the U.S., its $35.4 million box office take trailed the $43.8 million for Diamonds Are Forever. Many editors at the former Her Majesty’s Secret Servant website criticized the movie and its star in a survey several years ago. But the film has its fans. Originally posted Feb. 5, 2009. Re-posting because this year’s Oscars on Feb. 24 will have the biggest 007 component in 31 years. We’ve added some links that weren’t available when the original post was published. The Oscars (R) are coming up this month. That got us to wondering: What were the great James Bond moments at the Academy Awards? To see Wanstall pick up his Oscar, CLICK HERE. 1966: We weren’t watching, alas. Nor was the special effects wizard of Thunderball, John Stears. In extras for Thunderball home video releases available since 1995, Sears said he didn’t know he had won the Oscar (R) until his arrived in the U.K.
1974: Roger Moore is back, with one 007 film under his belt, and ready to film a second. He introduces Best Song nominee Live And Let Die, written by Paul and Linda McCartney. Instead of a performance by McCartney, the audio of the song is played while Connie Stevens dances to it. The song doesn’t win. 1978: The Spy Who Loved Me, nominated for three Oscars (R), is blanked, taking home none. Ken Adam, the production designer guru, loses out to Star Wars. Marvin Hamlisch is double blanked, losing out for best score and he and his lyricist fail to get the Best Song Oscar (R). 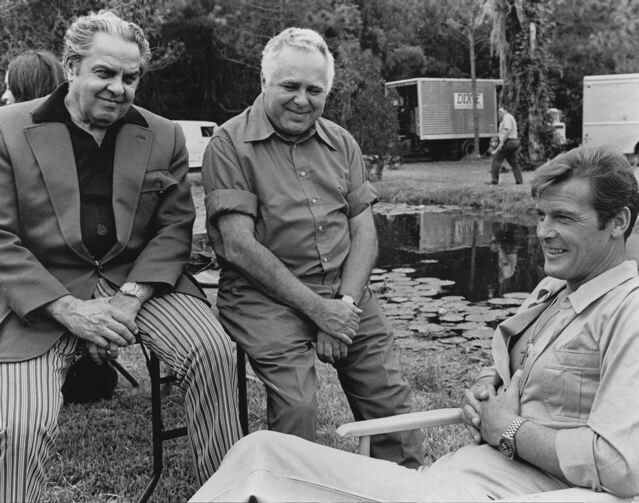 1982: Albert R. “Cubby” Broccoli, founding co-producer of the Bond franchise, receives the Irving G. Thalberg award, given to producers for a career of work. Then-Bond Roger Moore is on hand once again, this time to give Cubby the award. Note: Broccoli is shown twice in that video, once by mistake. What’s more, the music director for the Oscar (R) show is Bill Conti, composer of For Your Eyes Only, which was nominated for Best Song. Sheena Easton performs the song as part of an elaborate Bond dance act. The long skit includes Richard Kiel and, shortly before his death, Harold Sakata, the actor who played Oddjob, for whom Norman Wanstall labored for his sound effect years earlier. The only sour moment (from a Bond perspective): For Your Eyes Only didn’t win the Oscar (R). But it hardly ruined the evening for the Broccolis. To view the Sheena Easton performance of For Your Eyes Only, CLICK HERE. To view Albert R. Broccoli getting the Thalberg award, CLICK HERE.